With Ebola, Swine Flu, and now Zika being very recent memories, there have been plenty of people worrying that we as a species could face extinction by the hand of one bad bug. What people often forget however, is that we have survived much worse before. Here, we will take a look at the top ten diseases that brought us closest to the brink of cultural and actual extinction. These plagues are ranked by how effective the disease (or comorbidity) was at killing or disabling, how infective the plague happened to be and it’s effect on the global population at the time, as well as current prevalence and risk. Starting off this list is an epidemic that brought forth one of the most iconic medical devices of the industrial era; The Iron Lung. Formally known as Poliomyelitis and caused by the aptly named poliovirus, the disease was often referred to as Infantile Paralysis, this plague had an epidemic cycle spanning from 1894 until nearly 1950. Usually occurring in summer months and eventually associated to water contamination, symptoms would first appear as headaches before quickly turning much worse; Often including paralysis (as mentioned above) of pediatric and adult patients alike, and then depending on the exact area of the spine which was affected, death by suffocation could occur. For those that survived acute cases life long paralysis and underdevelopment, particularly of the legs was common. Though only about 5-10% of patients who contracted the virus died, over 30% of those who survived would develop Post-Polio Sequelae that would appear even 20 years after initial infection. This re-emergence of disease would come with it another chance for paralysis, as well as chronic fatigue, and several nervous system anomalies. Luckily, with the Polio vaccine and heavy elimination campaign, it is estimated to be a small threat in the coming years. A simulated model of Rickettsia bacteria (red). Not to be confused with Typhoid Fever (a deadly disease in its own right), Typhus was a major killer from the Middle Ages until just after World War Two, and is still endemic to several regions of the world today. Often presenting with symptoms of fever, chills and headaches, the flu like symptoms often take a week or so to fully develop. After this period of time, a trademark rash begins to appear across the back or chest and spreads, alongside sensitivity to light, some manner of delirium, and eventually if untreated, coma and in up to 60% of cases, death. Spread by a bacteria that is common on certain species of lice ( Rickettsia prowazekii), this disease has been historically related to crowded spaces, unhygenic conditions (such as ships and jails) and war zones. In fact, in some cases the deaths from ballistic wounds paled in comparison to Typhus on the very same fields of battle, taking some 150,000 soldiers on both sides of the Serbian portion of the Eastern Front in World War I, and taking a very notable individual, Anne Frank, during her time in internment. With treatment and vaccines for Typhus having been developed and distributed before 1950, the mortality has dropped from the list of major pathogens, down to causing only around one in every five million deaths. The most successful of the Flaviviridae family (which also includes the Zika Virus), Yellow Fever is a single stranded RNA virus which has killed 30,000 people a year since 1650, with occasional spikes in the 1800’s and late 1900’s. A tropical epidemic disease, Yellow Fever spreads through a common mosquito ( A. aegypti) and has particularly harsh effects in Africa and South America. Symptoms begin with the disease reaches the lymph nodes of the body, and then into the liver. This usually takes about 4 days, with a slow onset of flu like symptoms, back and muscle ache, and vomiting. Here, over 80% of patients see symptoms stop, and within a week they are back at full capacity and also immune from the virus onward. However for the remainder of patients, a toxic phase then occurs. Jaundice (a yellowing of the skin, and half the reason for the name) develops, as does bleeding from the eyes, mouth, and gastrointestinal tract. The latter will also induce vomiting of blood. Finally, the fever will continue to spike and send the patient into a delirious state, and the immune system will perform what is called a Cytokine storm (a massive overreaction to infection) which will kill healthy and infected cells alike, causing eventual death. In terms of prevention, there is a Yellow Fever vaccine which is often required to travel to or from countries with the virus. Sadly, the demand far outweights the supply at time of writing, and less than 50% of those living in affected countries are adequately immune. 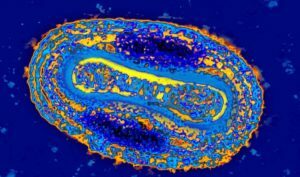 A colorized Electron Microscope image of the Small Pox virus. 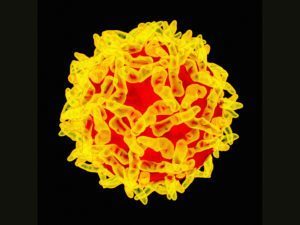 Perhaps one of the most feared diseases of the last 300 years, Smallpox oddly only killed around 2% of those infected. However, one must consider that Smallpox according to historical texts, has been around almost as long as civilization itself. The first known medical record of this plague goes all the way back to 1500 BC India. It was also among the very first of viruses to have a vaccine made (albeit from a less lethal but very related virus, Cowpox), and in 1980, one of the first major viruses to have been formally eradicated. Smallpox was also among the first to be used as a weapon with medical knowledge. A prime example of this was the eradication of many First Nation groups within the western hemisphere, and such tactics were knowingly sanctioned during both the Revolutionary War as well as the French and Indian War. While there are still some offensive biological weapons programs that have used Smallpox as a potential payload, most countries have abandoned such actions and the only “live” smallpox reservoirs are used for immunization and treatment purposes in case they are ever needed. Believed to be the infamous Black Death, the Bubonic (and associated Septicemic and Pneumonic) Plague had been the boogeyman of physician and patient alike for generations. Killing off nearly half the population of Europe during the 14th century, with previous death tolls in the tens of millions several centuries before, this disease had far reaching effects on economy, politics, and culture. Caused by a simple bacteria found on fleas called Yersinia pestis, this disease starts first in the lymphatic system where it grows and spreads, actively resisting the normal anti microbial defenses of the immune system. Lymph nodes, primarily in the groin begin to discolor and swell, allowing for the spread of the plague into the blood stream and subsequent discoloration of the extremities, lips and mouth alongside a remarkably high fever and tendency to vomit blood. 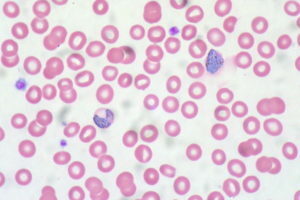 If left untreated, parts of the body can turn gangrenous and necrotic, literally rotting away as the person is still alive. Subsequent heavy infection of the blood of multiple pathogens, including pestis will then result in death. While vaccination is not very effective, the use of basic antibiotics when infected has shown great success in treating patients. As a result of its deadliness and psychologically jarring appearance, it has been used as a biowarfare agent, particularly by the Japanese Imperial Army, where bombs filled with fleas carrying the bacteria were dropped into cities in the hopes of disabling the populace. 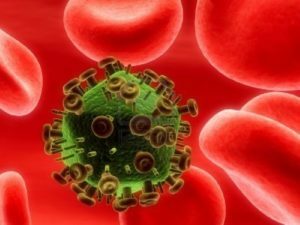 Very much a modern plague, HIV was first clinically discovered in the United States in 1981, with previous discovery of the virus in the 1950’s in central and western Africa. Thought to be a zoonotic transmission (spread from animal to human) and mutation of the Simian Immunodeficiency Virus, patient zero was most likely a hunter or handler of bush meat who may have had accidental blood to blood contact with an infected creature. Notorious for its remarkably difficult detection and asymptomatic presentation, it has become a major health concern worldwide, especially in countries whose economy and lack of widespread public health education make for a perfect breeding ground for the virus. 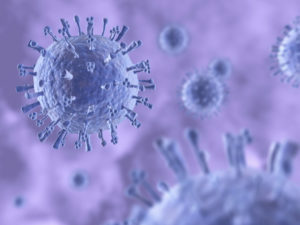 Amazingly, the virus itself, though devastating to the immune system doesn’t typically kill patients, but subsequent comorbidities (secondary infections or illnesses) tend to grow rapidly and end the life of the patient instead. Though there have been major steps in Anti-Retroviral therapies, there is still much work to do in terms of a cure. At time of writing, more than 1,000,000 deaths occur each year from the disease, and it is estimated that more than 30,000,000 individuals are infected. Given the fact that nearly half of the population is at risk for Malaria, this disease caused by parasitic infection has been among the most serious issues in global health for decades. Caused by the protozoans Plasmodium falciparum, malariae, ovale, or vivax, 214 million people annually suffer infections, often spread by Anopheles mosquitoes. Thought to be over 10,000 years old, this disease has changed very little in terms of symptoms despite having adapted greatly to some antibiotic treatment protocols. 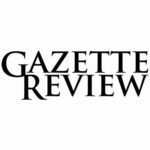 Symptoms include those of a flu-like nature after anywhere between a week and month of initial infection, followed by jaundice caused by liver and spleen disruption, digestive disturbances, and blood in the urine. In more severe cases (that cause over 600,000 deaths per year), eye twitching, seizures and other neurological symptoms arise besides coma, anemia and finally, death if untreated. Ironically, those individuals with sickle cell anemia (or have a family history of it) tend to be immune from infection. While Anti-Malarial medications are seeing some modicum of success, most of the focus on Malaria is prevention and elimination of the disease through control of its vector ,the aforementioned mosquitoes. 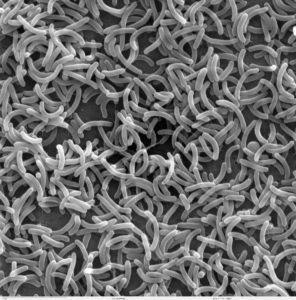 A high contrast image of bacteria responsible for cholera. The rise of modern epidemiology, as water treatment practices can be led back to one epidemic, which was caused by Cholera. A water borne, highly infectious and often deadly disease, Cholera is caused by the bacteria Vibrio cholerae, and if not treated properly, can kill one of every two infected, and is still an ongoing global pandemic. This plague is particularly violent in terms of symptoms, appearing only hours after exposure. The patient will suffer from severe headaches and diarrhea, losing up to five gallons of fluid a day as a result. This soon causes the individual to suffer from severe dehydration alongside a drop in blood pressure, and a wrinkling of the skin, and if left untreated, death. Of all the plagues on this list, Cholera has been noted as among the easiest to prevent if clean water systems and proper sewage systems can be maintained, a discovery which can be attributed to British scientist John Snow, which ended the epidemic of the 1850’s. Currently, around 5 million people worldwide suffer from infection, with around 100,000 dying on average per year. Yes, the very same flu strain that caused what was widely regarded as undue panic in 2009 also happened to be the second worst plague of all time. While 2009 saw nothing more than the usual outbreak numbers of flu every year and a surprisingly small amount of lives lost thanks to vaccination and improved treatment protocols, this was not the first time we as a species tangled with this beast. The first true encounter of H1N1 (then known as Spanish Flu) was in 1918, where over 120 million individuals died and 500 million had been infected. This disease, unlike many of the plagues listed so far, could and in fact did reach everywhere, from the arctic tundras to remote tropical islands. When paired with other diseases and the effects of World War One, H1N1 effectively dropped average global life expectancy by over a decade due to the immense loss of life. While symptoms were, as expected, flu-like, this particular strain has also been blamed for a secondary infection related disease of a unique sort, Encephalitis lethargica. For many patients, there was not only muscle weakness, a lack of response to stimuli and parkinsonian symptoms, but medical literature and first hand reports often describe the patients as being “locked” in appearance in regards to age. With the introduction of the drug L-Dopa, the symptoms of this particular disease can be lifted, and is no longer a problem for modern medicine. A colorized image from an electron microscope of the bacteria which causes Tuberculosis. Topping our list of most deadly plagues is one of the most infectious and hardest to treat diseases of all time, and a bane to health workers world wide, Tuberculosis. Having in previous generations been called consumption, TB is very much a sleeping giant in terms of disease. 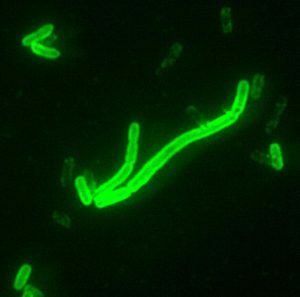 Despite only showing around 10 million cases per year as active, and about 2 million ending up as terminal, it is estimated that nearly a third of the earth’s population have some latent infection from the Mycobacterium tubercolosis bacteria. Part of the reason TB is very infectious is the nature of the symptoms themselves. Besides sweating, chills, weight loss and fatigue, sneezing and an exceptional amount of coughing may occur, often enough to cause bleeding or scarring in the lungs. Through this coughing, the bacteria can be spread to other healthy individuals who may or may not show positive symptoms there after. If the individual happens to be malnourished or infected with an immune suppressing disease such as HIV, problems can compound quickly. 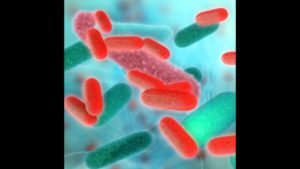 The bacteria can quickly over power any protections the body has, and spread causing hemorrhage within the lungs, meningitis, painful inflammation of the bone marrow, and an inability to clear sputum. This can often cause death to the individuals. 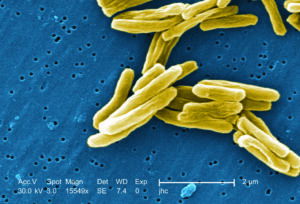 Treatment for Tuberculosis can be complicated at best, and in some regions of the world, nearly wholly impossible but for palliative (pain relief and comforting) care. The reason for this is while the standard tuberculosis bacteria is susceptible to multiple varieties of antibiotic, there are some very resilient strains who can take on anything the modern medical world can throw at it. While there is a vaccine, it is not 100% effective (decreasing risk for symptom presenting infection by 60%), so increased funding and research to treat and cure this disease, especially the antibiotic resistant strains are desperately needed globally.